Ten years ago my sister and her husband began building a life together. “Building a life together” may be a trite figure of speech, but no other phrase better describes their relationship. Building, literally, has been one of the most important parts of their life. Together they have established a landscaping business where they specialize in constructing walls, patios, water features, and fences. At home, they are busy converting their five acres of land into a sustainable farm with gardens, fruit trees and bushes, chickens, and hops for brewing their own beer. The one part of their life together they did not plan making was a baby. Since childhood, neither felt a desire to become a parent. This suddenly changed last year, and they are now excitedly anticipating the birth of their son. When planning a family shower for J & S, Amanda and I decided that the party should focus on the ideals they strive for in their life. The party also seemed a great opportunity to introduce their families to their lifestyle as “homesteaders." 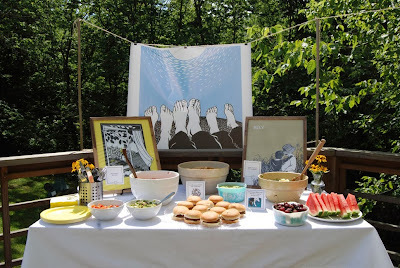 The artwork of Nikki McClure, an artist in Olympia, Washington, was used to decorate the party. McClure creates intricate paper cuts celebrating the joys of simple living and the beauty of nature. 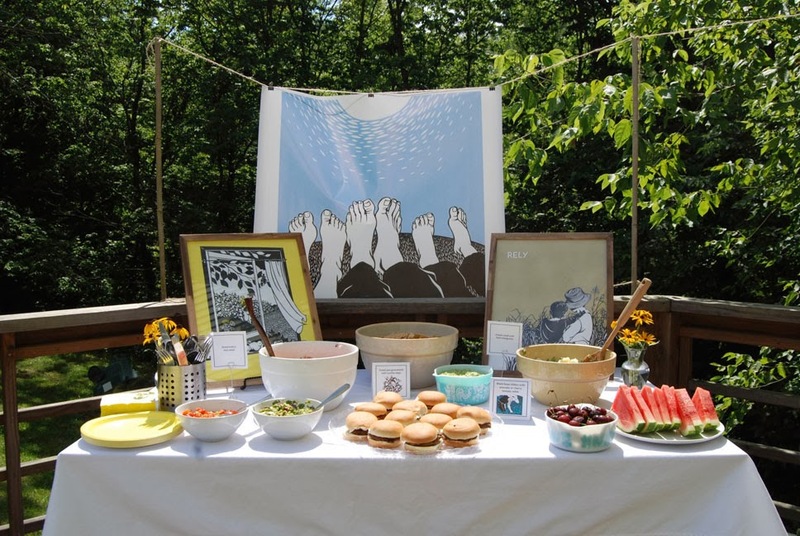 The decorations included greeting cards and two framed prints which could all be reused after the shower. The menu was built around seasonal foods we could purchase from local sources or harvest from J & S’s or other family member’s farms when possible. All the food was prepared from scratch . Sweet Pea Guacamole with Corn Tortilla Chips is one of the most popular appetizers at a local restaurant, FARM Bloomington. The recipe can be found on Earth Eats an Indiana Public Media podcast that focuses on recipes using local ingredients and sustainable agriculture. Sweet Sunflower Seeds are a quick snack made by toasting 1 cup of sunflower seeds with 1T of sugar, 1/4t of salt and 1t of lemon zest. Cucumber and Radish Sandwiches with Herb, Cheese Spread on Homemade Bread are a variation on a previous sandwich we made using a denser, homemade bread. Homemade Shrub Syrup Soda is an acidulated beverage made of fruit juice, sugar, and other ingredients mixed with carbonated water. Prior to the invention of refrigeration, a shrub syrup was a means of preserving fruit long past its picking. We reused the decorations for a second shower with friends. The menu was adjusted for lunchtime.